Where Do I Recycle or Donate Unwanted Items? 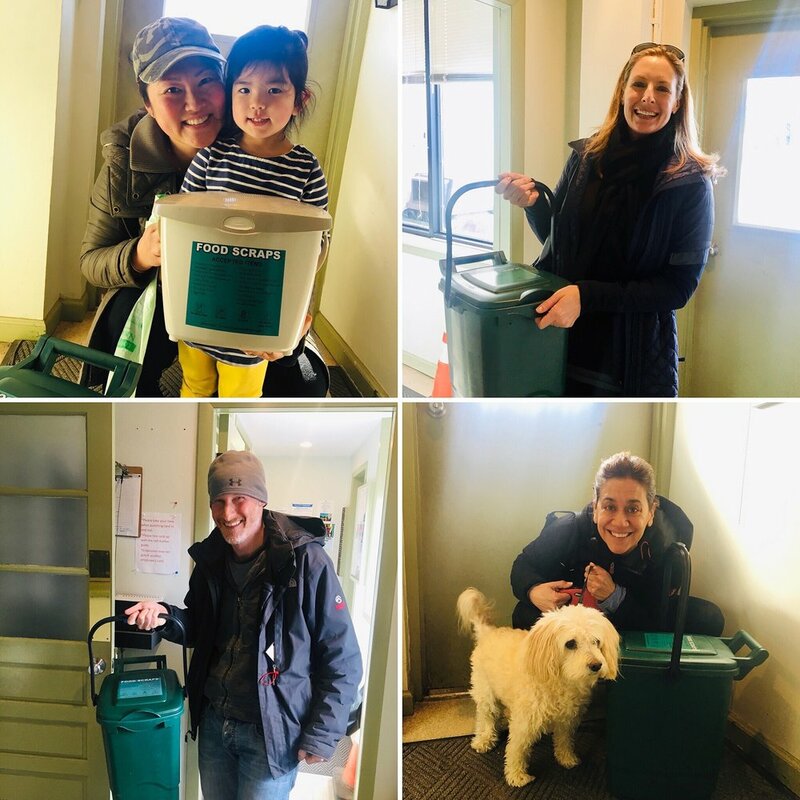 Join your neighbors and participate in Rye’s Food Scrap Recycling program! Ditch the device and get outside. Explore one of the many area parks or organizations (such as Rye Nature Center and Jay Heritage) with beautiful outdoor spaces. For more ideas, check out these local Earth Week events. The next Green Screen will be this Thursday, April 25, 6pm at Rye Country Day School. This year’s screening will be The Clean Bin Project, a film about whether it’s possible to live completely waste free. Special guest speaker: Chef, writer, and media host extraordinaire, Erica Wides. As always, the film, speaker and refreshments are free thanks to the generosity of Rye Sustainability’s Green Screen partner, Rye Country Day School. Register at Eventbrite. See here and here for a variety of cleanup activities planned in the area for Earth Day and Week. And to help keep Rye clean and beautiful, sign up for the RSC newsletter to be notified of upcoming events. Sign up for Rye’s Food Scrap Recycling pilot program. Hundreds of residents are taking part and you can too. Register online here (click on the yellow banana). Information and FAQs about the program can be found on the FSR Program Page. Say “No” today and every day. Bring your own Bag and consider eliminating plastic straws from your life. 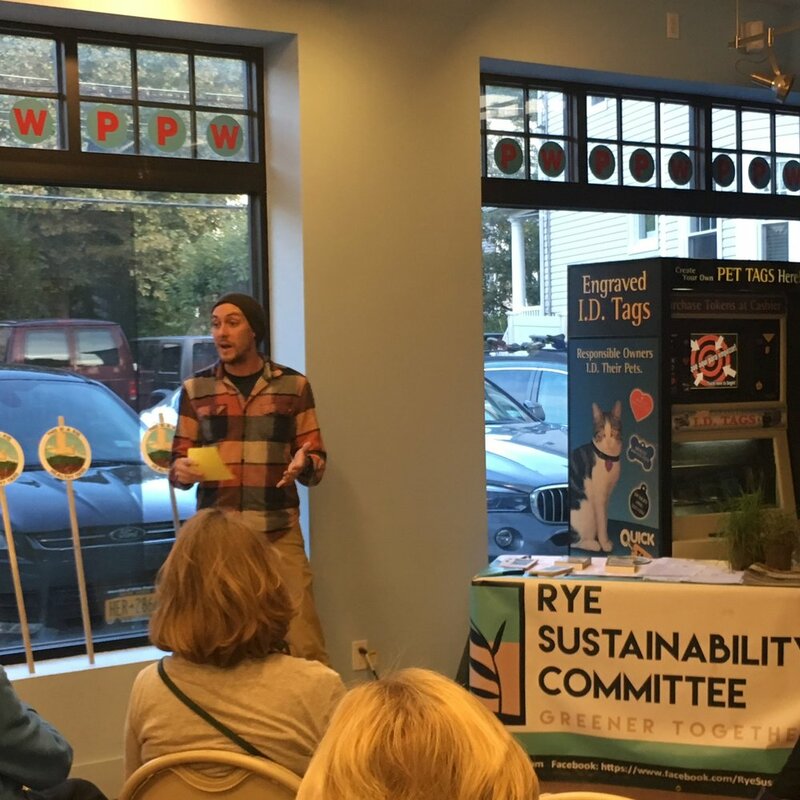 Read more about Rye Sustainability's Sound Shore Last Straw initiative here. One of Rye’s street trees funded by the Rye Tree Fund. You can do it in your own yard or donate to RSC's Tree Fund to help defray costs associated with street tree plantings. Read how to do it here, then complete the Rye Healthy Yard Pledge and receive your free lawn sign! It's easy to plant a pollinator garden and the colorful plants that attract pollinators are beautiful. 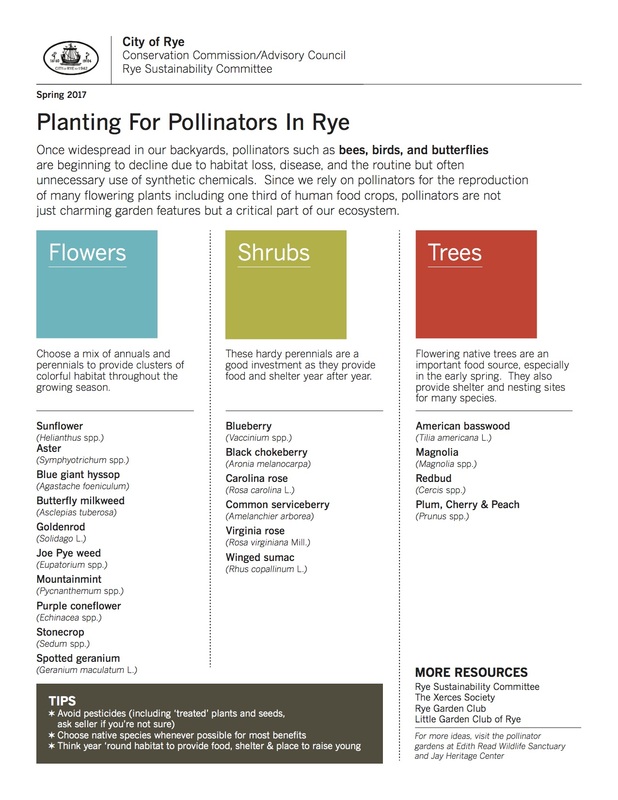 Visit Rye Garden Club's pollinator garden at Edith Read Wildlife Sanctuary and then use the pollinator pamphlet to plant your own. those wine corks at one of RSC's participating Put a Cork in it food establishments. Read about last year’s winners of the Rye Sustainability Leadership Award and what they've accomplished. This year's winner(s) will be announced on April 24 at Rye City Council’s general meeting. Take a look at RSC's Tips for Homeowners on how to live a sustainable life. With the New Year upon us and the possibility of a fresh start, consider a Green New Year’s resolution or two for 2019. To help you get started, here are a few ideas from some of the area’s local environmental and sustainability leaders. And if you’re still looking for inspiration, check out Rye Sustainability Committee members’ own New Year’s Resolutions! Reuse it. Pack a waste-free lunch for yourself and/or your kids. To include in your (reusable!) lunch bag: reusable water bottle, reusable metal food containers, reusable cloth (or other) sandwich bags, silverware, and a cloth napkin. Keep that car. Consider whether you can hang onto your car a bit longer. Maintaining your car as long as you can is the most cost efficient use of your automobile dollars and the fewer cars you buy, the less goes into the waste stream. Staying cool. Consider turning down your air conditioning next summer. Try fans. Pesticides. Remove at least one pesticide from your arsenal. Are you using chemicals to get rid of weeds in the patio or driveway? Hand pull them instead. Does your lawn care service apply some blanket herbicide as weed control? Try mulch-mowing or over-seeding in the fall to combat weeds that thrive in poor soils. Are you quick to grab a fungicide or pesticide if you see disease or an infestation on your prized ornamentals? Try an organic systemic soil additive or biologic control instead. The recent NY Times article on “The Insect Apocalypse” is a sobering read. Go native. In that vein, if you are adding to your yard, add natives or other beneficial plants and shrubs that will provide pollen and sustenance for native caterpillars and insects. The birds and larger bugs will appreciate it. Get OUT OF MY CAR!!! I'm good about walking when I can, but I am pushing myself - already in December! - to ride my bike to the store, take the bus to work, and get on the train to meet people in another village or town! It requires being more organized so that I give myself enough time to bike, or to be at the bus stop or train station on time. The extra exercise is a major benefit, and being able to read on the bus or train feels like almost like a chocolate reward! The challenge is the discipline of getting out early on my bike, or being on-time for the bus or train I need to take! Do I really NEED to buy this? In the interest of reducing the waste, the clutter, the maintenance that come with owning "things", in 2019 I am excited about slowing down my purchasing. I want to consider more carefully whether I really need to buy something, or whether if I dig through my closet I will find the item I need, or whether I can borrow it from a friend - or maybe even do without it!!! And if I DO decide I need to buy, I am excited about exploring whether I can buy it second-hand! I will continue striving towards a zero waste lifestyle - both at school and at home! I don't have a trash can in my office, which serves as a conversation starter and educational opportunity about the growing problem with waste in our society. The average American generates 4.4lbs of trash per day, but that number can be greatly reduced by recycling, composting, and reducing unnecessary packaging. Kerry reports that she also asks her AP Environmental Science students to write out their own green New Year’s resolutions. A good idea to get young minds thinking green! 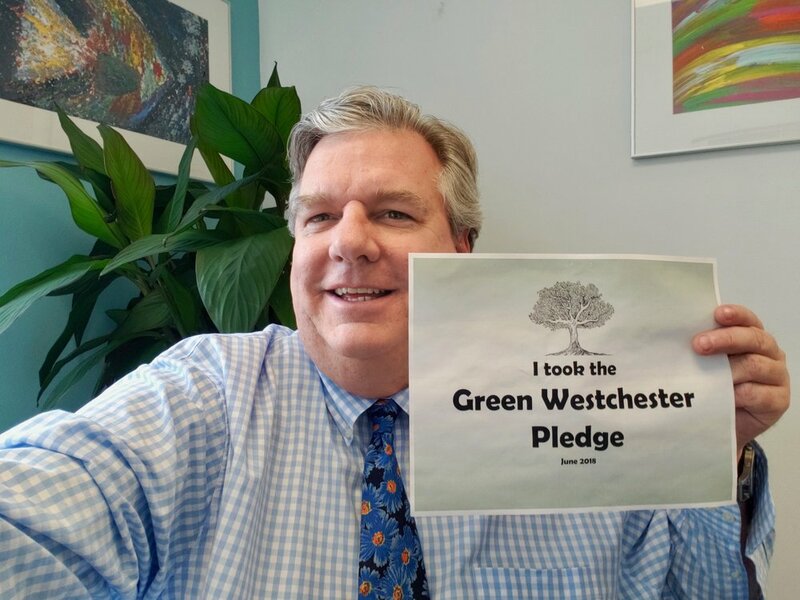 Peter has made the Green Westchester Pledge. Have you? Complete the installation of 30,000 LED bulbs across multiple County properties. Raise awareness. Talk more directly about the implications of climate change for our future well-being. Our reluctance to discuss it makes it easier for us to carry on as if this unprecedented challenge was not disrupting the miraculous natural processes and systems that sustain us. 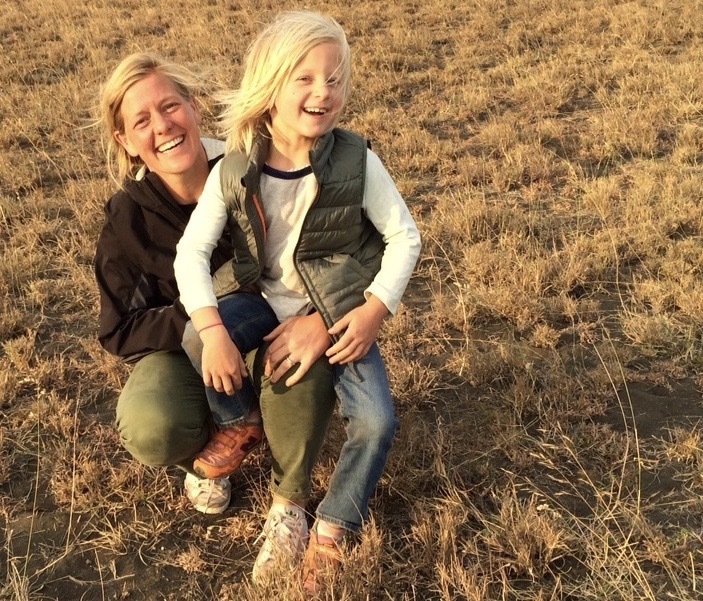 When we connect what science tells us about future conditions with the implications of those conditions for our children and all that we love, it spurs action and resolve. Reduce, reduce, reduce. Reduce use of plastics in all forms and to recycle all plastics that are recyclable (including bringing recyclable bags and plastics film to the grocery store for recycling). Convert to LED. I've already done this one but it's timely for many people: Converting your interior and exterior lights to LED. Look for "warm white" designation to replace any incandescent bulbs. LEDs save about 75% in energy usage and will last for many years. Number 1, by far: Purchase a food scrap recycling kit and start using it! Grasscycle. It’s so easy for your landscaper to do, requires no extra equipment, and has a significant environmental impact! Switch to an organic landscaping program. Get those little yellow poison signs off your law for good! Use a Green Garmento bag for dry cleaning, and always save and return your hangers to the dry cleaner! Don’t let the winter cold make you idle! Turn off that engine. Once a week, buy nothing. Christine suggests taking a look at Rye Nature Center’s Green Tips as well. My dream for 2019 is to help foster an understanding that going green is not just for the younger set. Our efforts to protect Mama Earth affect today's environment, economy and our overall health. I am working with members of The Apawamis Club Green Team to pinpoint areas that can easily go green without making a huge lifestyle impact to members. Our initial goals are to reduce the single use plastics such as straws and cups club wide and find alternatives to the coolers full of single use water bottles on the golf course. Waste reduction must span generations so that we can learn from and teach one another. Recycling is integral to regaining a balance of the environmental intricacies of our planet, but not using plastics in the first place beats all! Dropping temperatures have finally arrived. Warm apple cider, pumpkin spice lattes, and Halloween candy will soon allow us to indulge in this delightful time of year when the heat has finally abated and the trees give us a brilliant display of autumn beauty. Lucky for us we get well fed and have big sweaters to hide under until spring. What you may not realize is that fall is one of the best times to prep for that beautiful healthy green lawn you’ll enjoy next summer. Why? Leaves falling off trees return important nutrients back to the soil. This no-maintenance natural system keeps soil covered and naturally fertilized. With the introduction of modern lawn care last century we interrupted this cycle, leaving soil exposed with those nutrients literally removed and hauled away. Your soil is begging you to reconsider those leaves and finally leave them! It’s time to break them up and mulch them over your lawn. When leaves are mulched over your lawn they provide a vital - and natural - service. First, they keep small gaps covered. Your lawn lacks a sweater to hide under and it hates to be bare. Mulching leaves provides a fine layer of protection that keeps heat and moisture in your soil over the winter months. Keeping your soil covered also contributes to weed suppression. If your soil has a fine layer of mulched leaves, those spring weed seeds have a more difficult time making contact with the soil and are unable to germinate. Your grass is dormant, but weed seeds are actively seeking a new home. As leaves break down over winter, earthworms feed on them, weaving their way up and around the soil, naturally aerating it. Finally, mulched leaves return important minerals and nutrients taken by the tree from the ground, back to the ground leaving a naturally fertilized soil for your lawn to grow. Mulching your leaves over your lawn will not kill your grass; it will make it stronger. How is this achieved? There are a number of ways to work with your landscaper or mulch leaves in place yourself. The resources below will help you get started. It’s finally time to break them up and leave them …and focus on enjoying a pumpkin latte. Fall is the time to talk to your landscaper! Many landscapers have leaf mulching attachments available upon request. If your landscaper does not have one, they can mow a fine layering of leaves without it. Please request they consider purchasing one. If you manage your own lawn, there are an abundance of YouTube videos available to do it yourself. If you’re considering a new landscaper, consult Rye Sustainability’s landscaper directory for a list of suggestions. Working with a lawn care professional committed to natural landscaping practices is an important component to achieving a truly healthy yard. After watching Rye Sustainability’s 2017 leaf mulching demo at Rye Nature Center, Rye resident and RSC member Linda Mackay was inspired to buy a leaf mulching blower and mulch her own leaves. Linda reports that turning the leaves into mulch was very satisfying and only took an hour. It was very easy to manage and she had lots of mulch to spread around her beds. Rye Nature Center Director of Strategic Initiatives AJ Johnson. Humans and their furry friends flocked to Pet Pantry Warehouse this evening to hear about how to keep their lawns healthy and safe for their pets. 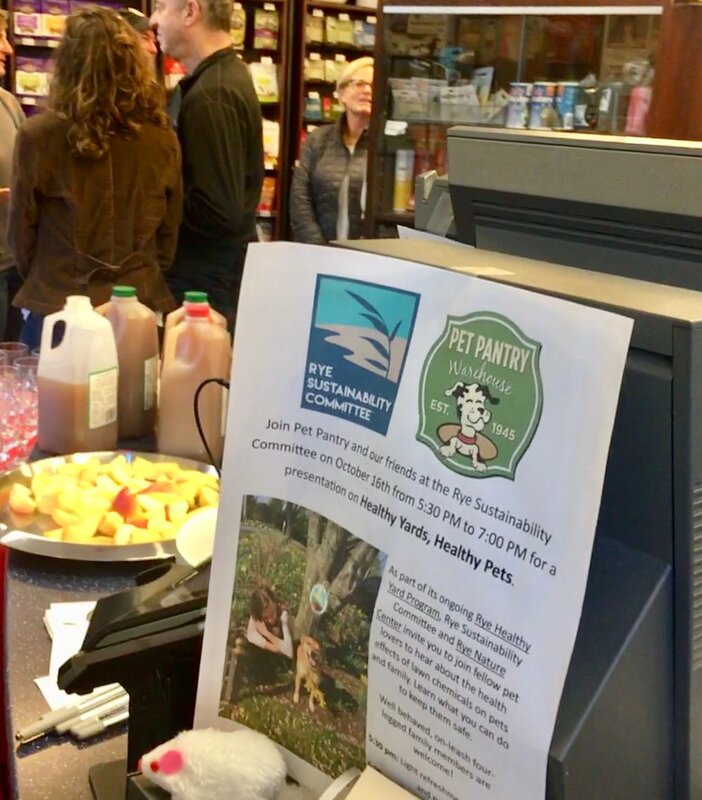 Rye Sustainability Chair Melissa Grieco kicked off the event by thanking Pet Pantry for generously hosting and providing treats for the four-legged attendees at their “Bark Bar.” Baked goods for humans were prepared by Rye Sustainability member and healthy cook extraordinaire, Jenny Hirsch. The main event of the evening was the presentation given by Rye Nature Center Director of Strategic Initiatives AJ Johnson. AJ holds a Bachelor of Science in Environmental Biology and has several years of experience in environmental education and outreach. He spoke about the health and environmental hazards of toxic chemical lawn applications and offered practical solutions. Keep pesticides from leaching into your yard from neighbors’ yards by using plant buffers. Some good native buffers include choke berry and switch grasses. Reduce lawn area with native plantings. Mulch leaves, leave grass clippings to retain moisture and insulate your lawn. Aerate your lawn as a natural way to get nitrogen deep into the soil. Consider using native grass for your lawn. Why? Native grasses reduce storm run off due to their deep roots (vs sodded turf grass). They act as a filtration mechanism for cleaning out toxins from the soil. Requires less mowing, so less air pollution. Native grasses act as a carbon sink. Pets and Poison: AJ mentioned contacting a pet poison hotline. A recent article on pets and poison provides information on what to do and who to call. Most importantly, remember that what’s outside can come inside. You may do your best to keep your home free of harmful toxins, but pesticides sprayed on lawns outside stick to shoes and pets and get tracked inside. A recent study about pesticides lurking in our home addresses this problem. 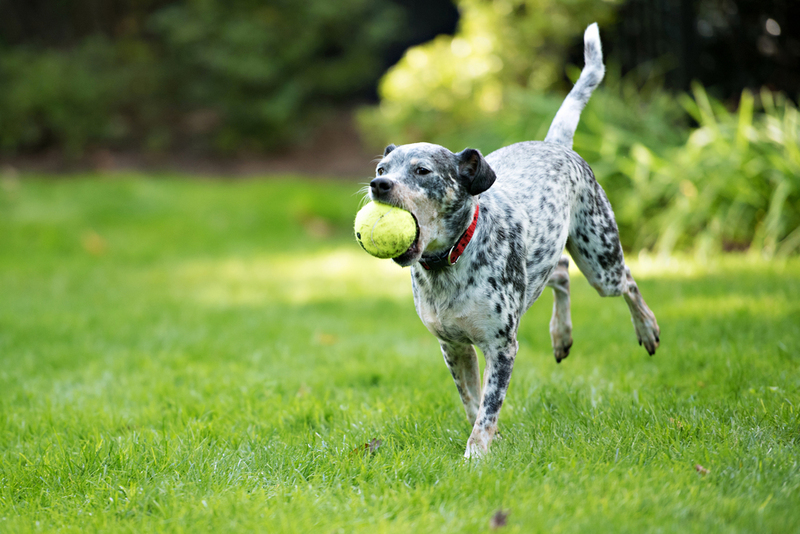 For more tips on how to keep your outdoor spaces pet- and human-safe, take a look at Rye Sustainability’s Takeaway Tips: Healthy Yards, Healthy Pets. Ditch the Device and get outside. Explore one of the many area parks or organizations (such as Rye Nature Center and Jay Heritage) with beautiful outdoor spaces. For more ideas, check out these local Earth Week events. Volunteer for a cleanup! There are a number of cleanups planned for Earth Day. To help keep Rye clean and beautiful, sign up for the RSC newsletter to be notified of upcoming events. Say No to single-use plastic today and every day. Bring your own Bag and consider eliminating plastic straws from your life. Read more about Rye Sustainability's Sound Shore Last Straw initiative here. Plant a tree! You can do it in your own yard or donate to RSC's Tree Fund to help defray costs associated with street tree plantings. Say No to harmful pesticides. Read how to do it here, then complete the Rye Healthy Yard Pledge and receive your free lawn sign! Say Yes to pollinators! It's easy to plant a pollinator garden and the colorful plants that attract pollinators are beautiful. 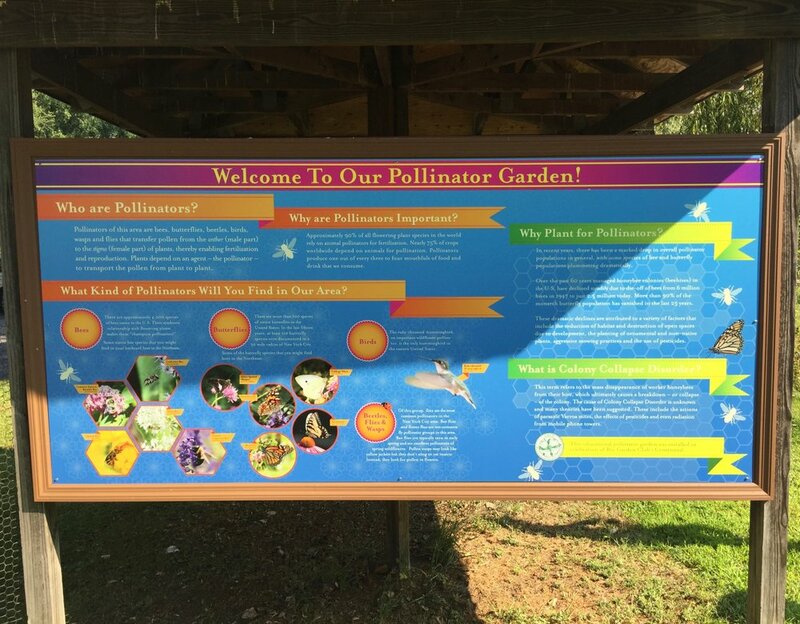 Visit Rye Garden Club's pollinator garden at Edith Read Wildlife Sanctuary and then use the pollinator pamphlet to plant your own. Recycle those wine corks at one of RSC's participating Put a Cork in It food establishments. Get inspired by leaders in sustainability. Read about nominees and winners of the Rye Sustainability Leadership Award and what they've accomplished. This year's winner will be announced on April 25 at Rye City Council. Need more ideas? Take a look at RSC's Tips for Homeowners on how to live a sustainable life. It's that time of year when we scratch our heads for meaningful yet attainable New Year's resolutions. As you try to sort it all out, Rye Sustainability members offer some suggestions to help your 2018 be a "green" one. We've also compiled a list of suggestions from other organizations. Consider eliminating plastic straws from your life. Read more here. Bring Your Own Bag. Did you know that Rye has a reusable shopping bag law? Read the details here and don't forget to bring your reusable bag when you go shopping. Make this the year to transform your yard into a healthy one. Read how to do it here, then complete the Rye Healthy Yard Pledge and receive your free lawn sign! Install a rain barrel in your yard. You can learn how from one of RSC's members here. Consider composting. Rye Nature Center's compost workshop tells you how and you can get more details here. Get a home energy audit and save some money while going green. Read more details here. Consider leaving your leaves in place this fall. Learn about how to do it here and watch the video from RSC's leaf mulching demo here. Increase your personal recycling rate by donating and recycling those unwanted items. Refer to RSC's Where Do I Donate/Recycle Unwanted Items? guide. Reduce air pollution by turning off your car engine. Rye’s ‘No Idling’ law prohibits idling for longer than 3 minutes. Learn more Idling Facts in our Resources section. Use reusable dry-cleaning garment bags. Although designed for school children, One World's Eco Passport contains a list of "eco actions" that everyone can print out and complete. Varsity's list includes simple action items, such as turning off the dryer and recycling paper. Huffington Post interviewed eco-friendly experts and celebrities for their suggestions, which include switching to a green energy supplier and avoiding disposable containers when purchasing fresh produce. EcoWatch lists 10 ways to be an environmental steward. Some ideas: Buy local and change your mode of transportation. Rain barrels are an excellent and economical way to capture rainwater from roofs for use on lawns and plants. The biggest hurdle is making the decision to set aside an hour or so to set up the system. Rye resident Colleen Margiloff recounts below how simple it is to install. Even a kid can do it! For more resources, please see the Gardening Tips page and links at the end of Colleeen's article. The process of going green has been slow and steady for our family. It started with recycling and then over the years its started to grow: eliminating pesticides from our yard, purchasing an electric car and now, a rain barrel. One day while it was raining, I began to think of the missed opportunity to capture that water for our plants, which I've kept alive in spite of my notorious brown thumb. I think this may have been one of the scariest changes for me since it required a power tool - not exactly my strong suit. However, with the help of my dad and kids, it took less than an hour to install and has allowed us to use less water. Like most things in life these days, I ordered mine online. With Amazon, Frontgate and Hayneedle, you have great choices. However, there are also local options from which to choose. You can order one online at Home Depot and then pick up at the store, or every spring the Greenburgh Nature Center sells them. They start at $75 and go up from there and max out at $200. Something to keep in mind is the location of the spigot. If you get a barrel with only one spigot close to the ground, consider getting a stand as well for easier access. Remove the down-spout running down the side of your home so that you can shorten it to fit into the rain barrel. Measure how long the down-spout needs to be to continue down the side of the house and into the rain barrel. We fit the existing curved piece back into the pipe and led it directly into the barrel. When sawing, keep in mind that it's easiest if you place a piece of 2 x 4 wood inside the pipe to prevent the aluminum from collapsing while it is being cut. Saw a bit on each of the four sides before sawing all the way through. Once the down-spout is securely in place, secure it back to the house and, if using a bent portion to lead it into the barrel, use a screw to hold the two pieces of down-spout together. The final step: attaching the spigots. To ensure a tight fit, wrap teflon tape around the threaded (male) portion of the spigot. You'll only need to wrap it a few times, making sure you pull it taut. Screw the spigot into the appropriate hole(s) by twisting it into place. It's helpful to have two spigots, with one lower to the ground, so that if there's a small quantity of water in the barrel, you can access water with the bottom spigot. Empty frequently after rain events so the barrel is ready for the next storm! Empty completely in winter and store in a shed or garage. A full barrel will freeze and break. Reconnect the downspout in winter or use a diverter. The dangers to pets of chemical use on lawns are very real. According to PET MD "many pets are susceptible to falling ill as a result of exposure to lawn chemicals." And the lingering effects of these dangers are profound: Pesticides that are applied outdoors "often make their way indoors and onto surfaces." According to the medical director of the ASPCA Animal Poison Control Center, "Lawn chemicals can vary widely in their safe use around pets. Some items such as fertilizers may only cause stomach upset, while others such as insecticides can be deadly." Lawn pesticides have been linked to cancer in pets, nervous system disruption, respiratory failure, and serious digestive problems. Even if you don’t use these chemicals on your lawn, a neighbor's lawn can also pose a threat. Use natural lawn care techniques. Check the Rye Healthy Yard Section for details. Never apply pesticides when pets are on the lawn. Remove all feeding bowls, water dishes, and pet toys from any area before applying a pesticide. Avoid using pesticide in pellet form because it can look like food. Watch for signs indicating when areas have been treated. Avoid walking in these areas with your pet for at least 72 hours. Get to know how your neighbors treat their lawns and how it can affect your pet. Let's all plan to make some healthy lawn changes today. Your furry babies will thank you! Additional information about pets and pesticides can be found here. The ASPCA Guide to Pet Safe Gardening can be found here. Does Organic Lawn Care Cost More Than Conventional? Beyond Pesticides is a nonprofit organization headquartered in Washington, D.C., which works with allies in protecting public health and the environment to lead the transition to a world free of toxic pesticides. In their Winter 2016 edition of "Pesticides and You" the editors responded to a reader's question that many of us have: "Is organic lawn care more expensive than conventional?" BP's response is reproduced in its entirety below and makes a compelling case for why residents and municipalities that decide to make the switch won't be breaking the bank. Do you think the City of Rye should adopt healthy landscaping practices for its open spaces? Let us know what you think by taking the very short survey on our Home Page. Question: I’m trying to work towards safer lawn care practices in my Homeowners Association, but I’ve run into problems with the board and administration that say that it’s too expensive to transition to organic. Do you have any information that could help me make the case that the “cost” of organic lawn care won’t break their bank? Answer: This is an argument used frequently to dismiss a commonsense change to organic and sustainable lawn care practices. While there is certainly a good amount of information that finds that a transition to safer methods is much cheaper in the long-term, start the conversation by reminding people why eliminating toxic pesticide use is essential in the first place. It is important to remember that the focus of pesticide reform is on public health. While the economic benefits of cosmetic pesticide use are concentrated within the chemical industry, the costs are often borne by individuals, particularly children, pregnant mothers, the chemically sensitive and others with compromised immune and nervous systems. Preventing or reducing the health costs associated with a child-hood disease should be considered a benefit to the community. Given that there have been numerous localities that have successfully implemented organic land care practices, the community should strive to do the same, and act as a leader in the protection of public health, particularly children’s health. But if an appeal to the greater good doesn’t make an impression, there are some well-respected sources to help you make your case. To start, look at the understanding the state of Connecticut has about organic lawn care. Its Department of Energy and Environmental Protection notes on its website, “If your lawn is currently chemically dependent, initially it may be more expensive to restore it. But in the long term, an organic lawn will actually cost you less money. Once established, an organic lawn uses less water and fertilizers, and requires less labor for mowing and maintenance.” Other respected institutions back up this experience. Harvard University has a long-running lawn care program that was transitioned off of chemicals nearly a decade ago, and the school wisely documented the economics of its transition. Harvard indicates that it was able to reduce irrigation needs by 30%, saving two million gallons of water a year as a result of reduced demand. The school was also spending $35,000 year trucking yard waste off site. 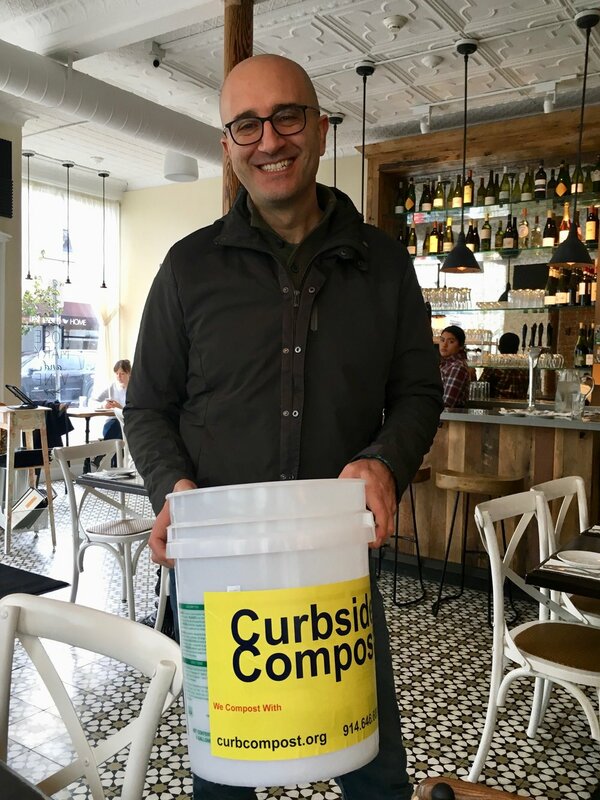 Harvard can now use those materials for composting and save an additional $10,000/year due to the decreased cost and need to purchase fertilizer from off-campus sources. Beyond Pesticides’ Board Member and nationally renowned turfgrass expert Chip Osborne conducted a study several years ago that compares the costs of conventional and organic turf management on school athletic fields. The report concludes that, once established, a natural turf management program can result in savings of greater than 25% compared to a conventional turf program. This report was conducted in 2010, and since then there have been significant improvements in organic-compatible products that help speed organic transitions. Seeing how cost issues play out at the community level can also be helpful. As part of Reno, Nevada’s pilot pesticide-free parks program, the city estimated that there would be no additional expenses to transition off of pesticide use. City staff stated in a report, “There are no cost implications as staff will implement changes within its adopted budget.” The city estimated it spends approximately 1.4% of total maintenance time applying herbicides, and 4.1% of time using manual or mechanical weed control alternatives. To implement the program, the Park’s Department discontinued herbicide use and began to implement alternative strategies that include the use of organic products, burning, or additional manual or mechanical weed control. The City did not expect the total time spent on weed control to differ as a result of the change in practices. RSC's healthy yard co-chair Liz Garrett and Lenny Merone (Merone Landscaping) field questions from the audience. The room at the The Rye Nature Center overflowed with people as they crowded in to learn more about how to transform their yards into healthy and safe spaces. 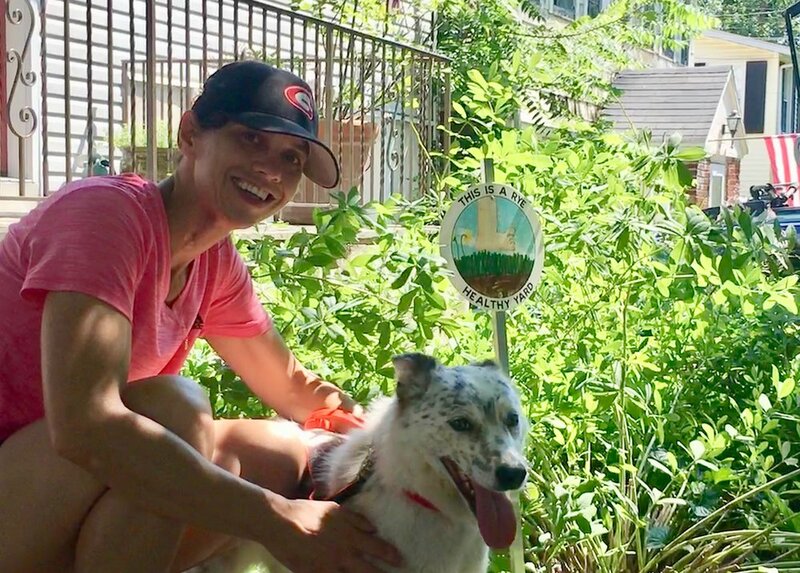 The goal for RSC and healthy yard program partner, Rye Nature Center, was to spark a conversation between the homeowner and landscaper about natural landscaping. After introductions by RSC chair Sara Goddard, RSC member and healthy yard co-chair Liz Garrett took over to frame the issue that so many of us struggle with: how to maintain a yard that is both beautiful and natural? As Garrett pointed out, homeowners recognize the dangers inherent in applying synthetic pesticides to their lawns, but fear that if they "go natural" they'll end up with a weed-infested yard. "There's got to be a better way," Garrett concluded, and this event was intended to show the way. Rye resident Stephanie Spierings shared her experiences about going organic. After a few minutes of personal insights by Rye resident Stephanie Spiering on how she made the switch from conventional to organic landscaping, the audience jumped right in. Landscaper Lenny Merone fielded questions, but the success of the event was the enthusiasm from audience members, eager to learn how to make the transition. The collaborative nature of the event, where people shared tips and ideas, along with expert guidance from Merone and Garrett was energizing, and demonstrated the desire for residents to make a positive and healthy change. Did you miss the talk? No worries, the entire event can be viewed here, thanks to Rye TV. Surrounded by the delicious smells of freshly baked muffins and brewed coffee, a small group gathered in Rye resident Mary Lyons' gorgeous home last week to learn about the benefits of natural landscaping. As part of Rye Sustainability's Healthy Yard Program (RHYP), RSC organizes neighborhood coffees at homes where the homeowner practices natural landscaping. The purpose of the coffees is to learn about RHYP in a small setting and how simple it is to transform a yard into a natural and safe environment. Although it was too cold to venture outside to wander around, Mary's naturally landscaped yard is a beautiful piece of property. Rye Nature Center Director of Conservation and Land Stewardship, Taro Ietaka, led the conversation by walking us through his five lessons for a healthy yard. We then had a chance to ask questions and share lawn care tips before we continued with our day. Want to learn more about how to talk to your landscaper about organic lawn care? Attend our workshop at Rye Nature Center on January 27th. Details and how to register here. If you're a Rye resident with an organic and/or natural yard and would be interested in hosting a coffee for your neighbors, please contact us. Lawn & Garden Pesticides: What You Need to Know, provides an overview of pesticides, health risks and how we can reduce exposure. Glyphosate-Based Weed Killers examines one of the most widely-used pesticides. For information about the types of chemicals and ingredients contained in numerous household and garden products, visit the NY State Department of Environmental Conservation's information portal. Learn more about how you can create a healthy yard by visiting our Rye Healthy Yard and Resources Section. Should the City of Rye adopt a natural landscaping policy for its public spaces? Let us know what you think by responding to our survey on the RSC Home Page. 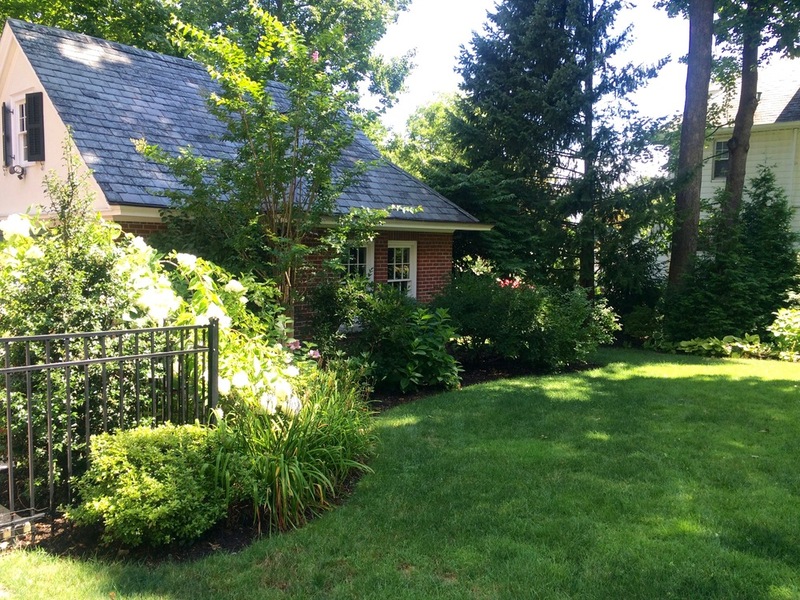 Rye Sustainability's Healthy Yard Contest: We Have a Winner! Grand Prize Winner Liv McNamara's winning design. The Rye Healthy Yard sign design contest is over and the winners have been announced. The Grand Prize winner is Liv McNamara. Congratulations Liv! Visit the contest photo gallery to view all entries and watch Rye TV's coverage of the event. Details about the age category winners can be found below, including more photos from the contest. Visit the Rye Healthy Yard page to learn how you can make your yard safe and healthy. Then take the RHYP pledge so you can receive a lawn sign with the winning design! Judges: Catherine Parker, Jennifer Sandling, Christine Siller, Tracy Stora, Danielle Tagger-Epstein and Mayor Joe Sack for announcing the winners. And a special thank you to Rye Arts Center for graciously opening their doors to host this contest! Thank you to Rosemary & Vine for the delicious refreshments! Grand Prize winner Liv McNamara explains to Mayor Sack how she came up with the winning design. Contest winners Reese Wolfe, Charlotte Lee, Julia Zanolin, Liv McNamara and Mattia Gibbs, with RSC chair Sara Goddard, Rye Arts Center board member Jen Sandling and Mayor Sack. Have you wondered what it looks like to have an open space that’s free of toxic chemicals? Do you think you have to make a trade-off between beauty and safety? Check out RSC's new photo gallery of Rye families’ healthy yards to see stunning examples of how you can have both beauty AND safety. And maybe you’ll see your neighbor’s yard! Do you have photos to share? Contact us! Ready to install the door! Did you know that seven species of bees were placed under the protection of the Endangered Species Act for the first time? You may have read about the declining bee population in the U.S., but pollinators as a group are in peril. In the last few decades, bee and butterfly pollinator populations of some species have plummeted. It has been difficult to pinpoint the exact cause of the decline, but evidence points to a number of stressors, including loss of natural habitat, diseases, loss of genetic diversity, and exposure to certain pesticides. 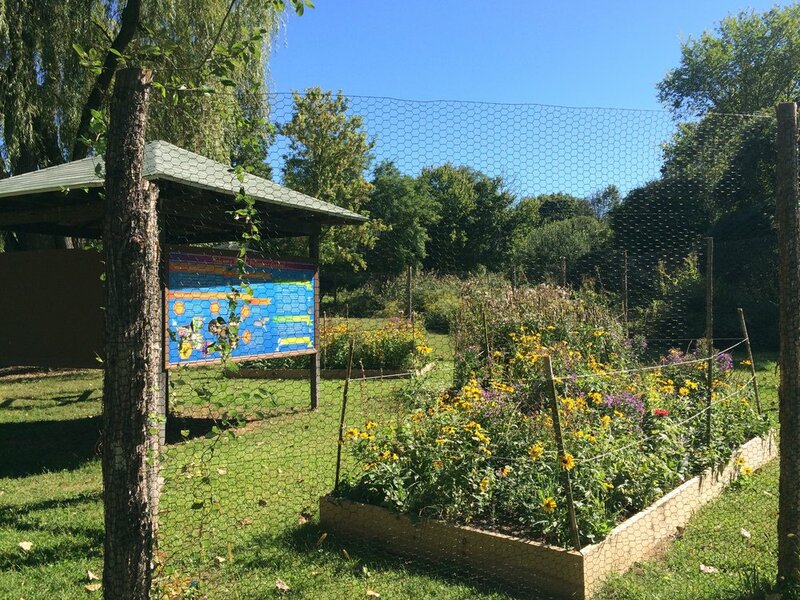 In April 2015, the Rye Garden Club, in honor of the Club's centennial anniversary, donated a pollinator garden to Edith G. Read Wildlife Sanctuary. RGC members designed the garden layout, selected appropriate pollinator-friendly native plants and helped construct and install the garden. In addition, RGC created informational panels for the kiosk next to the garden. After touring the garden, visitors can read about why pollinators are so important and learn how to build their own garden. Rye Sustainability Committee will cover more in future posts about the importance of pollinators, so stay tuned. In the meantime, visit Edith Read and check out the Rye Garden Club Pollinator Garden. Although its past peak season, you'll be able to read the information boards and start planning your own pollinator garden! Visit RGC's website for more photos, a PDF of the signage, a general list of pollinator-friendly native plants, and a list of all the native plants, including photos, used in the garden. Are you thinking about switching from conventional to natural lawn care but don't know how to make the transition? The fall season is a perfect time to make the switch and transform your yard into one that's healthy and beautiful for all. First, it's important to understand why making the change is so important. It all starts with the definition of "healthy." A healthy - and by extension, beautiful - yard is one that starts with good soil. Beyond Pesticides, a non-profit environmental organization committed to ending reliance on pesticides, states it clearly in their Organic Lawn Care 101 sheet: "Healthy soil contains high organic content and is teeming with biological life. Healthy soil supports the development of healthy grass that is naturally resistant to weeds and pests. In a healthy, fertile and well maintained lawn, diseases and pest problems are rare." In fact, applying damaging and dangerous chemicals is the worst thing homeowners can do if the objective is a beautiful yard filled with vibrant plants, trees and a lush green lawn. As Rye Nature Center's Director of Conservation & Land Stewardship, Taro Ietaka, points out: "synthetic pesticides and herbicides kill beneficial soil micro-organisms that are helping your plants." So now that you know why you should make the change, how can you care for your yard with the goal of minimizing pesticide applications? Here are some fall lawn care tips to get you started. 1. Mow High Until the Season Ends – Bad mowing practices cause more problems than any other cultural practice. Mowing with a dull blade makes the turf susceptible to disease and mowing too close invites sunlight in for weeds to take hold. Keep your blades sharp, or ask your service provider to sharpen their blades frequently. For the last and first mowing, mow down to 2 inches to prevent fungal problems. For the rest of the year keep it at 3‐3.5 to shade out weeds and foster deep, drought‐resistant roots. 2. Aerate – Compaction is an invitation for weeds. If your lawn is hard, compacted, and full of weeds or bare spots, aerate to help air, water and fertilizer to enter. If you can’t stick a screwdriver easily into your soil, it is too compacted. Get together with your neighbors and rent an aerator. Once you have an established, healthy lawn, worms and birds pecking at your soil will aerate it for free! 3. Fertilize, but go easy and go organic! – Fertilizing in early fall ensures good growth and root development for your grass. Nitrogen, the most abundant nutrient in lawn fertilizers promotes color and growth. Adding too much nitrogen, or quick release synthetic fertilizers, will result in quicker growth and the need for more mowing. Too much nitrogen can also weaken the grass, alter the pH, and promote disease, insect, and thatch build‐up. If applied too late, nutrients can leach directly into nearby surface waters. Be aware of local phosphorus or nitrogen loading concerns. Your soil test results will ensure that you apply only what you need. 4. Overseed With the Right Grass Seed – Once again, fall is the best time to seed your lawn. Grass varieties differ enormously in their resistance to certain pests, tolerance to climatic conditions, growth habit and appearance. Endophytic grass seed provides natural protection against some insects and fungal diseases ‐ major benefits for managing a lawn organically. Talk to your local nursery about the best seed for your area. Check to see the weed content of the grass seed and that there are no pesticide coatings. "Leaf mulching is the practice of chopping leaves into small pieces. Mulching can be done with a lawn mower or a leaf shredder. Mulched leaves can be left on your lawn (they fall between the grass blades) or piled 3" or 4" deep on garden beds and around shrubs where they act as a protective layer in the winter and, in the growing season, prevent weed growth and help conserve water. 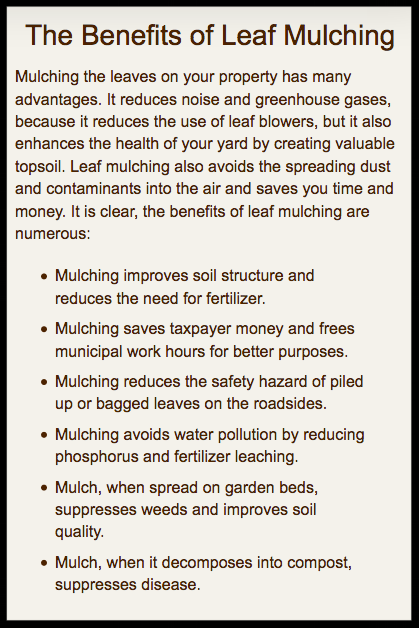 Leaf mulch decomposes over time, adding important nutrients and structure to the soil." To learn more about how you can mulch leaves in your yard this fall, visit the Leave Leaves Alone or Love 'Em and Leave 'Em sites. The benefits of soil testing cannot be overstated. It's simple to do and homeowners will be provided with a comprehensive profile of their soil upon which to build the foundation of their natural lawn. For a modest fee, Rye residents can have their soil tested and analyzed through the Westchester Cornell Cooperative Extension. For more information on healthy soil and landscaping practices, watch RSC's What's Under Your Lawn presentation. Part III: Should the City of Rye Adopt a Healthy Lawn Policy? 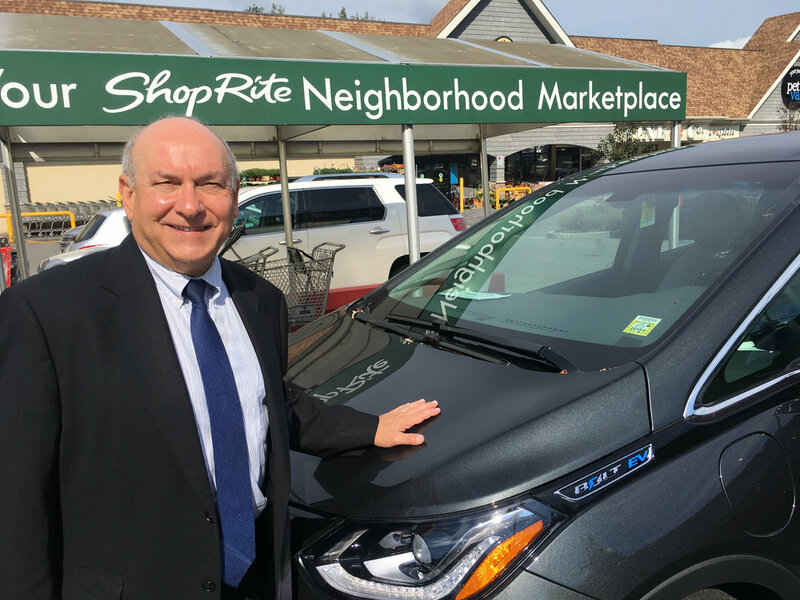 The Rye City Review's Josh Stabile provides a clear and comprehensive overview of one of Rye Sustainability's latest initiatives: whether the City of Rye should adopt a healthy lawn policy for its public spaces. You can read his article online at The Rye City Review. It is also reproduced below. The Rye Sustainability Committee is asking residents whether or not the city should adopt a healthy lawn policy. At a Rye City Council meeting on Aug. 3, Councilwoman Danielle Tagger-Epstein, a Democrat, announced that the committee had released an online survey for residents to give their opinion on whether or not Rye should adopt a healthy lawn policy. The survey can be found on RyeSustainability.com. Tagger-Epstein said the survey, which consists of only one question, would “literally take under a minute” to complete. She even encouraged attendees at the meeting to take the survey on their phones as she made the announcement. Sara Goddard, chairwoman of the city Sustainability Committee, said the group wants to work with the City Council on a policy that would require the city to use organic, pesticide-free landscaping in all public spaces. The committee hopes to garner enough positive feedback from residents—in the form of at least a few hundred survey votes—before proposing a policy to the City Council. Although there is no timetable for when the survey will conclude, the committee is doing its homework and gathering as much information about changing over to pesticide-free landscaping as possible. 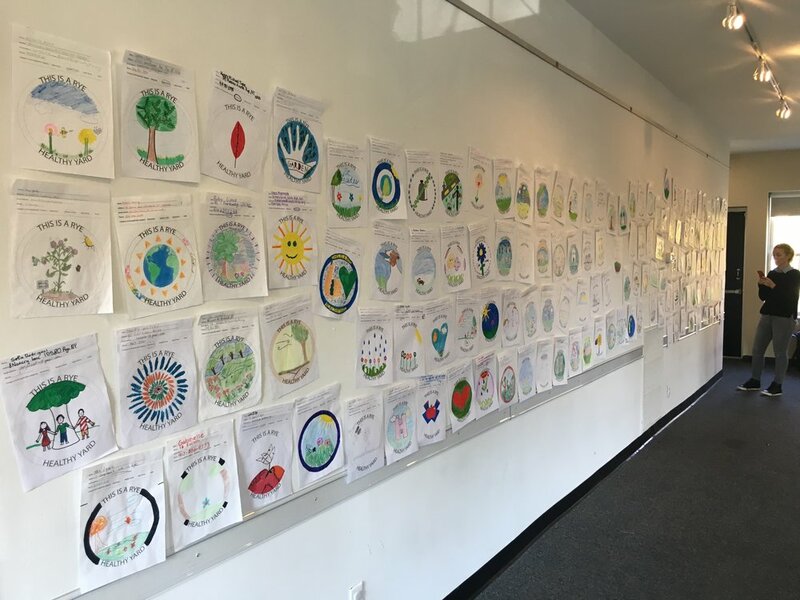 Homeowners in Rye have been encouraged to use pesticide-free landscaping for years, and this year, the committee announced a communitywide lawn sign design contest to create a logo for the official Rye Healthy Yard Program. Goddard said she thought a policy of chemical-free landscaping in public spaces had been implemented a while ago, but found out that no policy seems to exist. If there is indeed an old policy that has not been in use, Goddard said it’s time to “dust it off” and update it with help from the City Council to come up with a policy that can satisfy everyone. If no policy ever existed, Goddard said one needs to be written. Towns such as Greenwich, Connecticut, and Yorktown have already established policies regarding organic and chemical-free landscaping in their public spaces, so Goddard said it shouldn’t be difficult for Rye to follow their lead. In fact, a news article about Greenwich’s healthy lawn policy, Safe Lawns, is exactly what caused the Rye Sustainability Committee to post its survey and gather residents’ opinions. Residents who want to see what else the committee is working on can visit its website or visit and like its Facebook page, Friends of Rye Sustainability Committee. For more information and background, read our posts on the subject and please take the very short survey on our Home page. We want your input! East Hampton's Healthy Lawn Policy: A Model for Rye? Rye resident Caroline Walker, has lived in her beautiful home for eight years with her husband, adorable twin boys and rescue dogs, Chipper and Trixie. 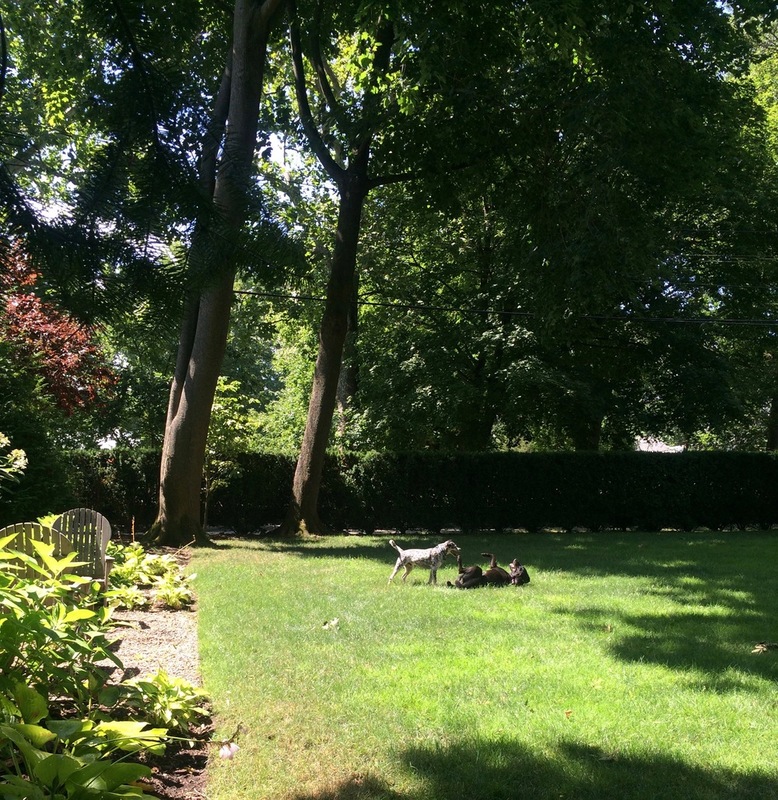 On a recent summer day, Chipper and Trixie took advantage of the Walkers' gorgeous yard to run, play and roll, ignorant of the knowledge that their beautiful play area is a healthy and safe space, free of toxic or synthetic chemicals. Landscape designer Peggy Pierce Peters, helped plan and design a completely natural outdoor living area for the Walker family. What better gift for your family and friends - and pets! - than to create a natural sanctuary for all to enjoy? Thanks to Geoff Tischman Photography for the three spectacular close-up photos of the dogs in the yard! How Valuable Are Your Trees? We all know that trees provide a beautiful natural setting for suburban and urban communities, but did you know that they can also add an economic benefit? The Tree Benefit Calculator attempts to quantify these benefits. The Tree Benefit Calculator allows anyone to make a simple estimation of the benefits individual street-side trees provide. This tool is based on i-Tree’s street tree assessment tool called STREETS. With inputs of location, species and tree size, users will get an understanding of the environmental and economic value trees provide on an annual basis. Simply enter information about a street-side tree and learn about the benefits it provides. 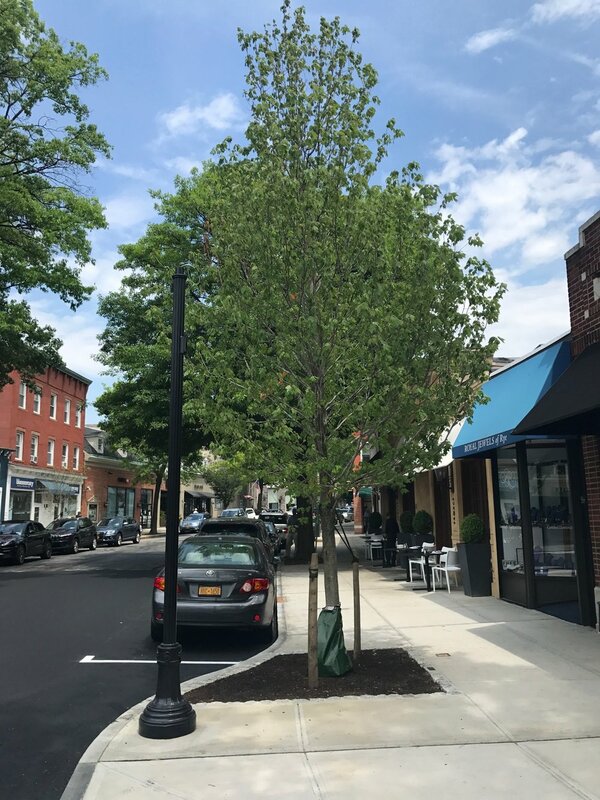 Street-side trees are typically located in front yards, medians, parkways, planting strips or other common planting areas adjacent to streets.